Grasslands are characterized as lands dominated by grasses rather than large shrubs or trees. In the Miocene and Pliocene Epochs, which spanned a period of about 25 million years, mountains rose in western North America and created a continental climate favorable to grasslands. Ancient forests declined and grasslands became widespread. Following the Pleistocene Ice Ages, grasslands expanded in range as hotter and drier climates prevailed worldwide. There are two main divisions of grasslands: (1) tropical grasslands, called savannas, and (2) temperate grasslands. Savanna is grassland with scattered individual trees. Savannas of one sort or another cover almost half the surface of Africa (about five million square miles, generally central Africa) and large areas of Australia, South America, and India. Climate is the most important factor in creating a savanna. Savannas are always found in warm or hot climates where the annual rainfall is from about 50.8 to 127 cm (20-50 inches) per year. It is crucial that the rainfall is concentrated in six or eight months of the year, followed by a long period of drought when fires can occur. If the rain were well distributed throughout the year, many such areas would become tropical forest. Savannas which result from climatic conditions are called climatic savannas. 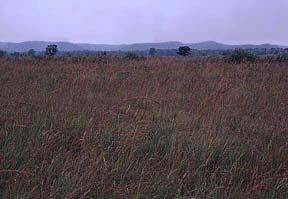 Savannas that are caused by soil conditions and that are not entirely maintained by fire are called edaphic savannas. These can occur on hills or ridges where the soil is shallow, or in valleys where clay soils become waterlogged in wet weather. A third type of savanna, known as derived savanna, is the result of people clearing forest land for cultivation. Farmers fell a tract of forest, burn the dead trees, and plant crops in the ashes for as long as the soil remains fertile. Then, the field is abandoned and, although forest trees may recolonize, grass takes over on the bare ground (succession), becoming luxuriant enough to burn within a year or so. In Africa, a heavy concentration of elephants in protected parkland have created a savanna by eating leaves and twigs and breaking off the branches, smashing the trunks and stripping the bark of trees. Elephants can convert a dense woodland into an open grassland in a short period of time. Annual fires then maintain the area as a savanna. The soil of the savanna is porous, with rapid drainage of water. It has only a thin layer of humus (the organic portion of the soil created by partial decomposition of plant or animal matter), which provides vegetation with nutrients. Savannas are sometimes classified as forests. The predominant vegetation consists of grasses and forbs (small broad-leaved plants that grow with grasses). Different savannas support different grasses due to disparities in rainfall and soil conditions. Because the savanna supports such a large number of species competing for living space, usually only one or a few kinds of grass are more successful than the others in a particular area. For example, in drier savannas such as those on the Serengeti plains or Kenyas Laikipia plateau, the dominant grasses on well-drained soils are Rhodes grass and red oat grass; throughout the East African savannas, star grasses are dominant; the lemon grasses are common in many western Uganda savannas. Deciduous trees and shrubs are scattered across the open landscape. One type of savanna common in southwestern Kenya, Tanzania, and Uganda, known as grouped-tree grassland, has trees growing only on termite moundsthe intervening soil being too thin or poorly drained to support the growth of trees at all. Frequent fires and large grazing mammals kill seedlings, thus keeping the density of trees and shrubs low. Savannas receive an average annual rainfall of 76.2-101.6 cm (30-40 inches). However, certain savannas can receive as little as 15.24 cm (6 inches) or as much as 25.4 cm (10 inches) of rain a year. Savanna has both a dry and a rainy season. Seasonal fires play a vital role in the savannas biodiversity. In October, a series of violent thunderstorms, followed by a strong drying wind, signals the beginning of the dry season. Fire is prevalent around January, at the height of the dry season. Fires in savannas are often caused by poachers who want to clear away dead grass to make it easier to see their prey. The fires do not devastate the community. Most of the animals killed by the fires are insects with short life spans. A fire is a feast for some animals, such as birds that come to sites of fires to eat grasshoppers, stick insects, beetles, mice, and lizards that are killed or driven out by the fire. Underground holes and crevices provide a safe refuge for small creatures. Larger animals are usually able to run fast enough to escape the fire. Although the dry stems and leaves of grasses are consumed by fire, the grasses deep roots remain unharmed. These roots, with all their starch reserves, are ready to send up new growth when the soil becomes more moist. The scattered shrubs can also subsist on food reserves in their roots while they await the time to venture above the soil again. Unlike grasses and shrubs, trees survive a fire by retaining some moisture in all their above-ground parts throughout the dry season. Sometimes they have a corky bark or semisucculent trunk covered with smooth resinous bark, both being fire resistant. A fire leaves scorched earth covered with a fine layer of powdery black ash in its wake. During March, violent thunderstorms occur again, this time heralding the rainy season. When the rains come, savanna bunch grasses grow vigorously. Some of the larger grasses grow an inch or more in 24 hours. The savannas experiences a surge of new life at this time. For example, many antelope calves are born. With so much grass to feed on, mothers have plenty of milk. Calves die if the rains fail to come. Other animals (which do not all occur in the same savanna) include giraffes, zebras, buffaloes, kangaroos, mice, moles, gophers, ground squirrels, snakes, worms, termites, beetles, lions, leopards, hyenas, and elephants. There are also some environmental concerns regarding savannas such as poaching, overgrazing, and clearing of the land for crops. Temperate grasslands are characterized as having grasses as the dominant vegetation. Trees and large shrubs are absent. Temperatures vary more from summer to winter, and the amount of rainfall is less in temperate grasslands than in savannas. The major manifestations are the veldts of South Africa, the puszta of Hungary, the pampas of Argentina and Uruguay, the steppes of the former Soviet Union, and the plains and prairies of central North America. Temperate grasslands have hot summers and cold winters. Rainfall is moderate. The amount of annual rainfall influences the height of grassland vegetation, with taller grasses in wetter regions. As in the savanna, seasonal drought and occasional fires are very important to biodiversity. However, their effects arent as dramatic in temperate grasslands as they are in savannas. The soil of the temperate grasslands is deep and dark, with fertile upper layers. It is nutrient-rich from the growth and decay of deep, many-branched grass roots. The rotted roots hold the soil together and provide a food source for living plants. Each different species of grass grows best in a particular grassland environment (determined by temperature, rainfall, and soil conditions). The seasonal drought, occasional fires, and grazing by large mammals all prevent woody shrubs and trees from invading and becoming established. However, a few trees, such as cottonwoods, oaks, and willows grow in river valleys, and some nonwoody plants, specifically a few hundred species of flowers, grow among the grasses. The various species of grasses include purple needlegrass, blue grama, buffalo grass, and galleta. Flowers include asters, blazing stars, coneflowers, goldenrods, sunflowers, clovers, psoraleas, and wild indigos. Precipitation in the temperate grasslands usually occurs in the late spring and early summer. The annual average is about 50.8 to 88.9 cm (20-35 inches). The temperature range is very large over the course of the year. Summer temperatures can be well over 38° C (100 degrees Fahrenheit), while winter temperatures can be as low as -40° C (-40 degrees Fahrenheit). The fauna (which do not all occur in the same temperate grassland) include gazelles, zebras, rhinoceroses, wild horses, lions, wolves, prairie dogs, jack rabbits, deer, mice, coyotes, foxes, skunks, badgers, blackbirds, grouses, meadowlarks, quails, sparrows, hawks, owls, snakes, grasshoppers, leafhoppers, and spiders. There are also environmental concerns regarding the temperate grasslands. Few natural prairie regions remain because most have been turned into farms or grazing land. This is because they are flat, treeless, covered with grass, and have rich soil. Temperate grasslands can be further subdivided. Prairies are grasslands with tall grasses while steppes are grasslands with short grasses. Prairie and steppes are somewhat similar but the information given above pertains specifically to prairiesthe following is a specific description of steppes. Steppes are dry areas of grassland with hot summers and cold winters. They receive 25.4-50.8 cm (10-20 inches) of rainfall a year. Steppes occur in the interiors of North America and Europe. Plants growing in steppes are usually greater than 1 foot tall. They include blue grama and buffalo grass, cacti, sagebrush, speargrass, and small relatives of the sunflower. Steppe fauna includes badgers, hawks, owls, and snakes. Today, people use steppes to graze livestock and to grow wheat and other crops. Overgrazing, plowing, and excess salts left behind by irrigation waters have harmed some steppes. Strong winds blow loose soil from the ground after plowing, especially during droughts. This causes the dust storms of the Great Plains of the U.S.